This set of photos were taken on a run of time from before Halloween and Thanksgiving 2013. The location was in and about my house in Bethesda, MD. The "Take It!" The thought came about when setting up this year to accommodate trick or treater's with the usual packaged candy. This year it was M&M's with peanuts. This is a favorite, however called for asking children if they were allergic to peanuts to have them trade with someone else for non peanut treats. 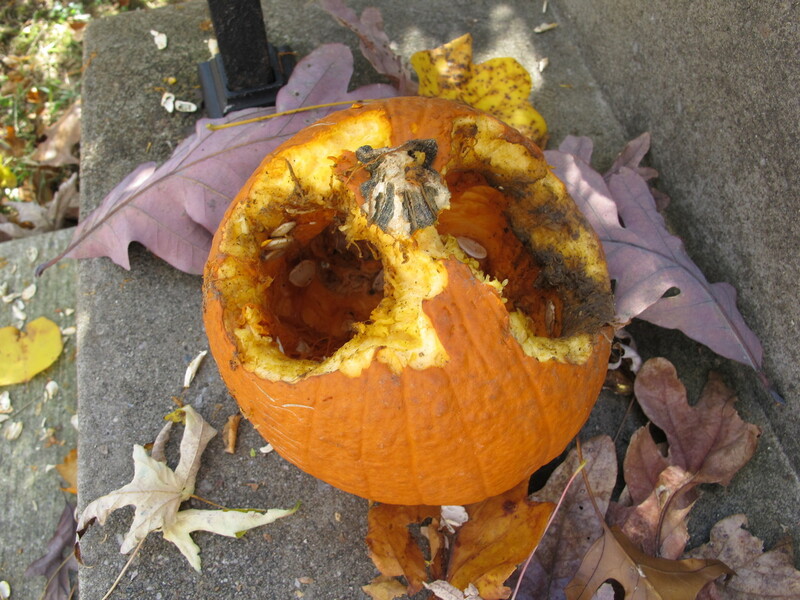 Several years ago squirrels found the carved pumpkins on the front steps to be their liking and began to eat them before Halloween even took place. The end result was a pumpkin presentation of chomped up faces that had kids asking us what happened. 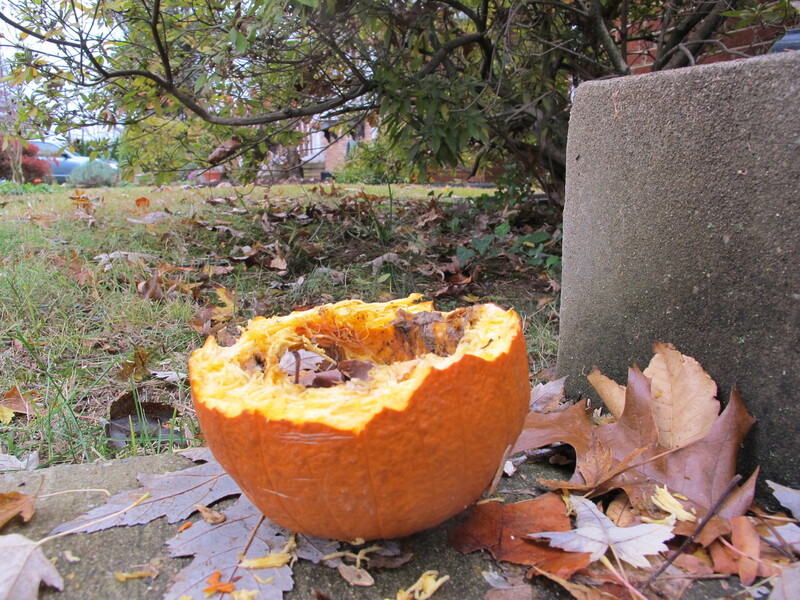 The next year I found a bunch of Styrofoam pumpkins to put out - and the squirrel problem was fixed. 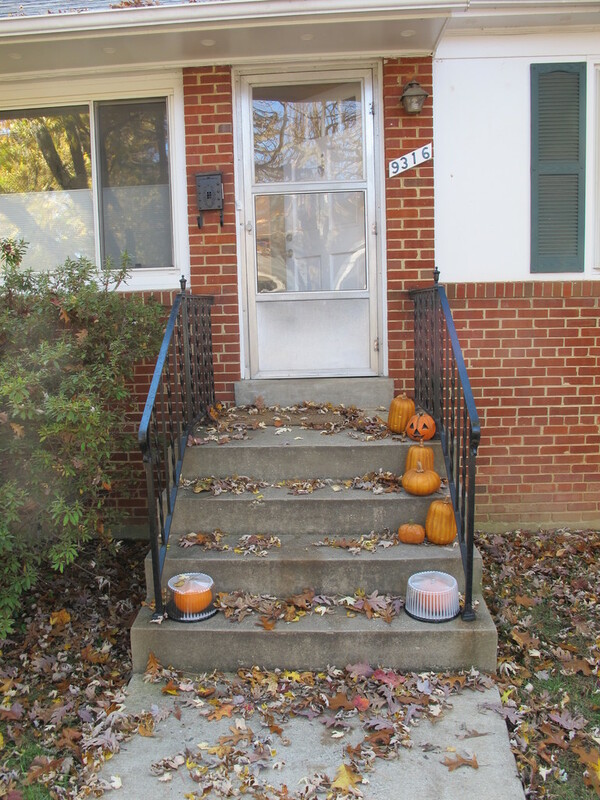 The placing of the fake pumpkins this year on the steps reminded me of the years ago incident. I decided it was time to thwart those little devils and started to think about some sort of way to win this game. On the day before Halloween It came to me. 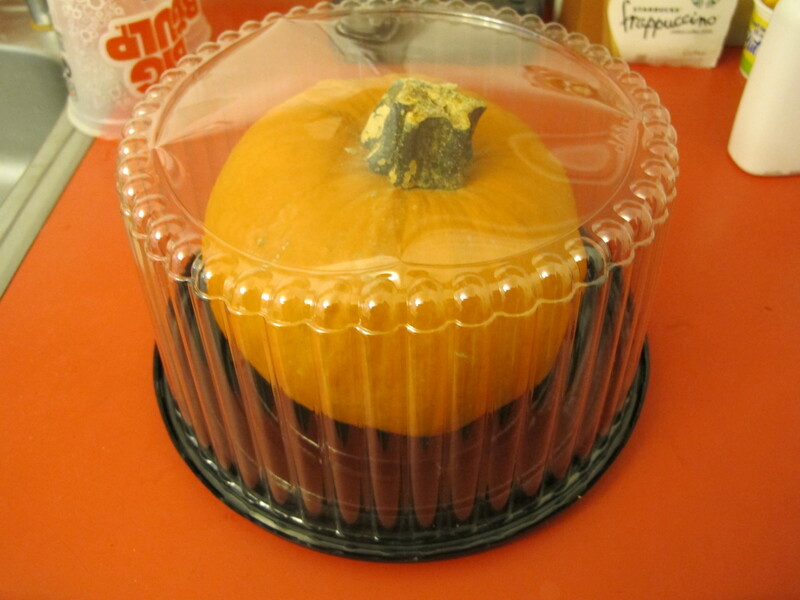 I went to the neighborhood grocery store and bought small pumpkins and then went to the bake shop and asked for tall plastic cake containers. The baker did not charge me after hearing my plan for the squirrel revenge - lol. 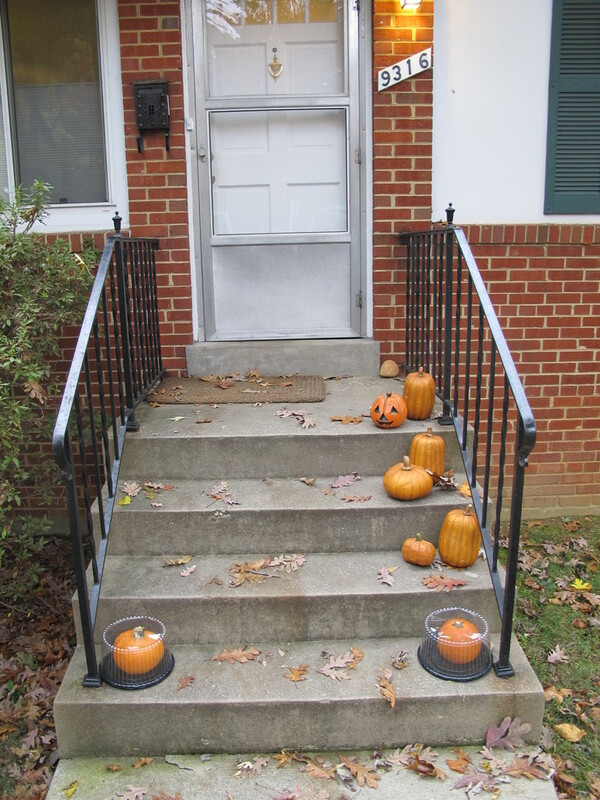 The pumpkins were placed in their protective covers and put out on the bottom step. Some parents that were accompanying their children asked about them. They liked what was going on - lol. The candy give out part of the night, was gotten through, and saw lots of creative costumes. After letting the real pumpkins build up lots of condensation, to the point that one could no longer see the pumpkins - I took one into the house to keep as fall decoration and left the other out for the squirrels to eat. As you can see from the several photos progressively showing their having their daily fill - the pumpkin is down to about four days left. 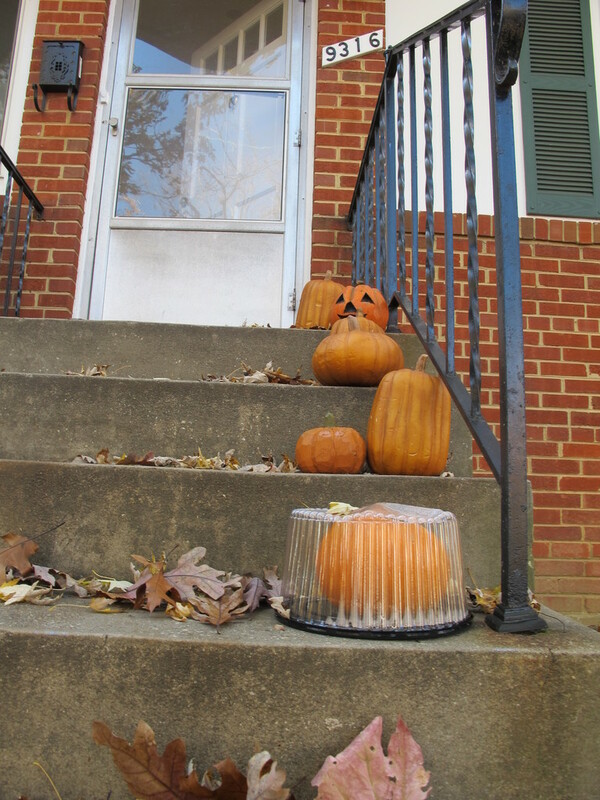 The fake pumpkins are now back in storage and with them the cleaned up cake lids to play the same game next year - lol. The After Take: Everyone likes this story and the photos that go along with it. What a cute read, too funny! Not a bad idea. 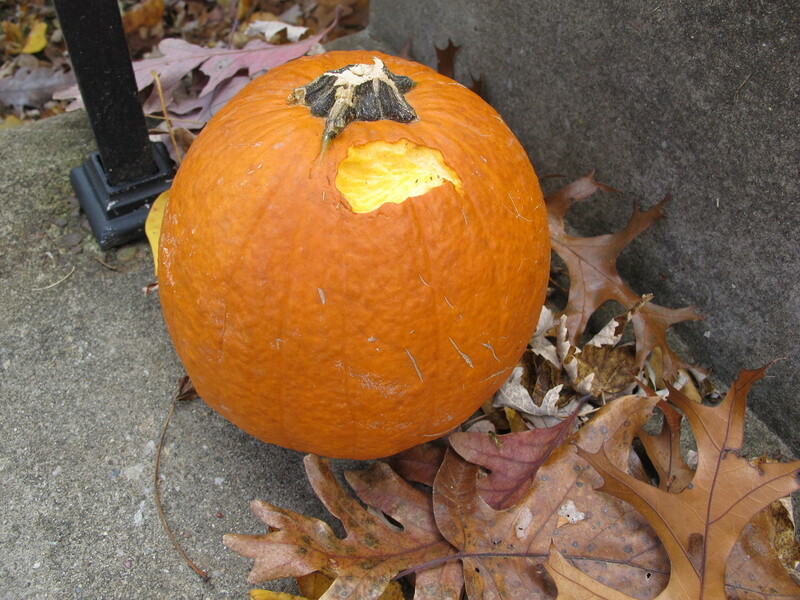 I guess its better to have a squirrel problem than to have teens that like to blow up pumpkins. Believe it or not it was actually a problem in our town at one point. Pretty innovative way to keep the vermin at bay. 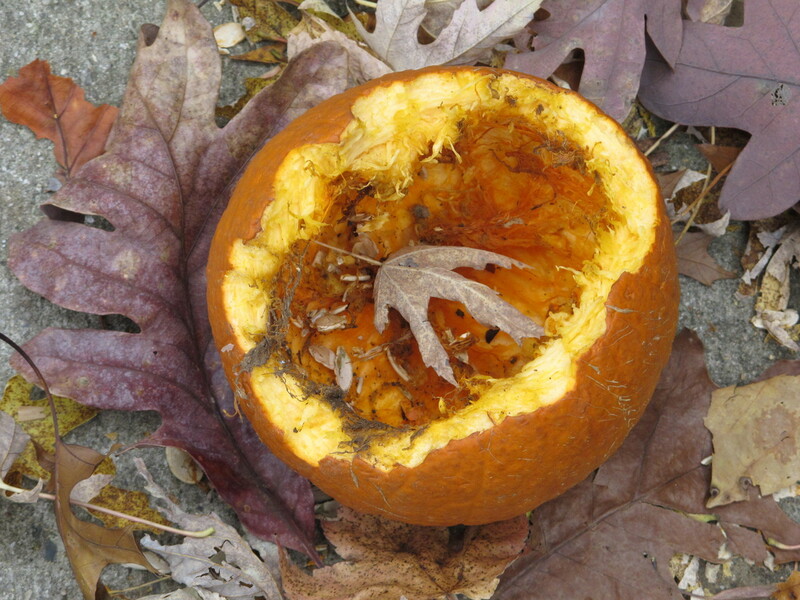 Did the squirrels ever fall for the fake pumpkins? Any little nibble marks in them?